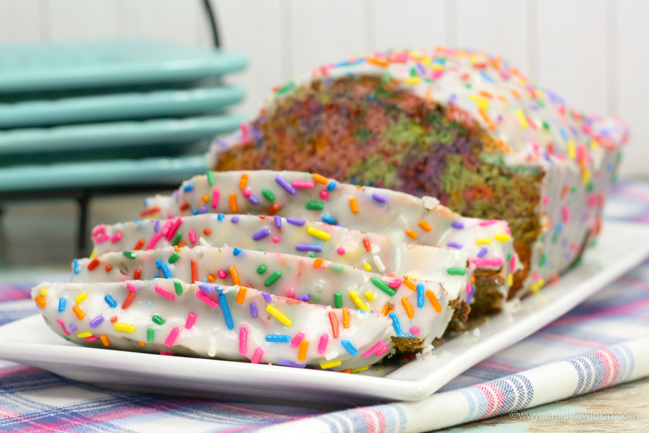 Perfect for Unicorn Breakfasts, Unicorn Parties, National Unicorn Day and more, bake up a batch of this delicious and fun Unicorn Banana Bread! Hi friends! 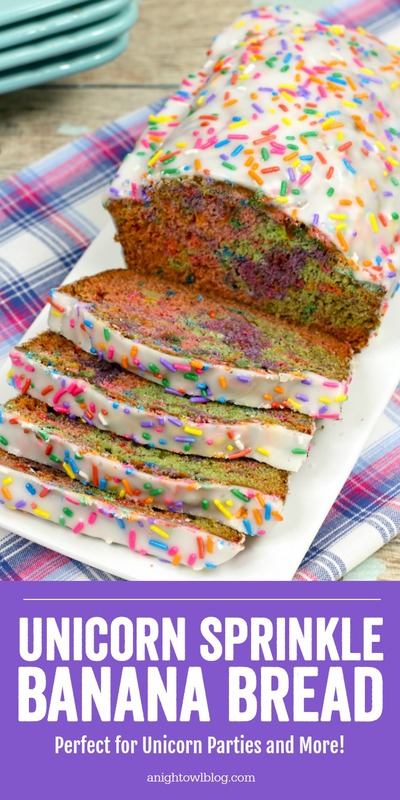 This super fun, super yummy, Unicorn Banana Bread would be perfect for Unicorn Birthdays, Unicorn Parties, National Unicorn Day or any ole day of the week! I remember loving unicorns (and all things Lisa Frank) when I was young so getting to relive the unicorn magic is always a blast. They’re certainly having their moment once again. And we’re happy to oblige and create around this magical trend. Preheat the oven to 350 degrees and spray a 9×9 loaf pan with baking spray. In a large mixing bowl, whisk together the flour, baking soda, and salt until combined. 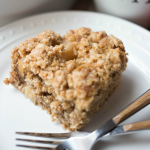 Using a standing mixer, beat together the sugar and butter until smooth and creamy. Beat in the eggs, one at a time until combined after each eggs. 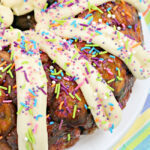 Mix in the mashed banana’s then gradually mix in the dry ingredients until combined. 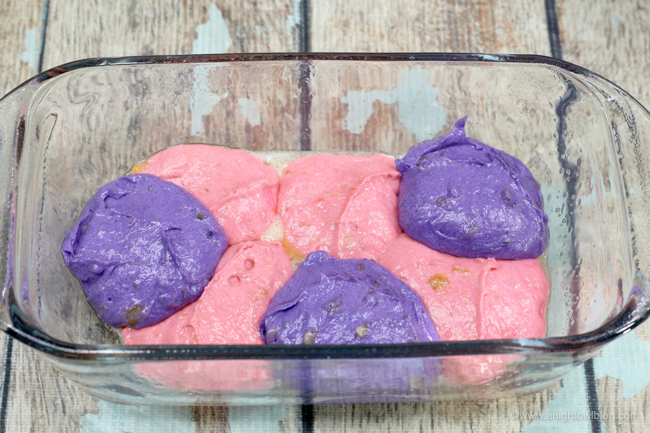 Divide the batter into 3 bowls, add a few drops of the pink gel food coloring into 1 bowl. Add a few drops of the purple gel food coloring into the second bowl and a few drops of the neon green gel food coloring into the third bowl. Mix the colors until combined. 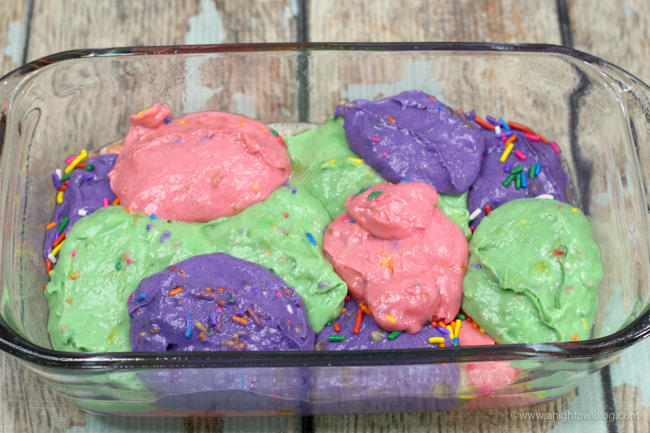 Using the medium ice cream scoopers, scoop a few dollops of the pink batter into the loaf pan, then the purple. Sprinkle about 1/4 C of sprinkles onto the top of the two colors. 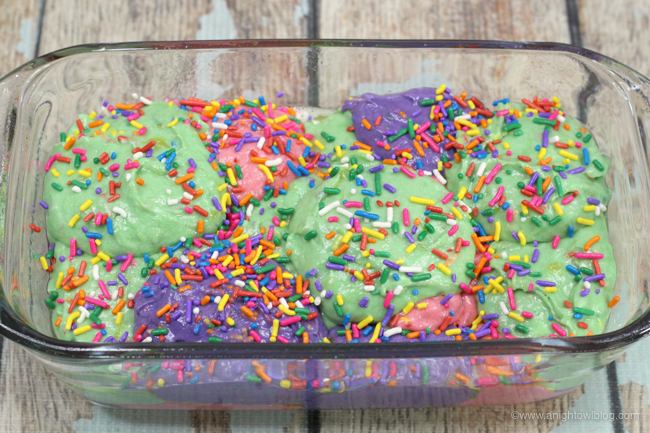 Mix in 1/4 C of sprinkles into the neon green batter Scoop the neon green batter onto the top of the other two colored batters. 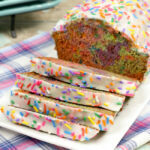 Sprinkle the remaining sprinkles onto the top of the batter. Bake in the oven for 45-65 minutes or until a toothpick comes out clean. For the icing, using a large mixing bowl, whisk together the sugar and milk until combined and smooth and pour over the loaf. 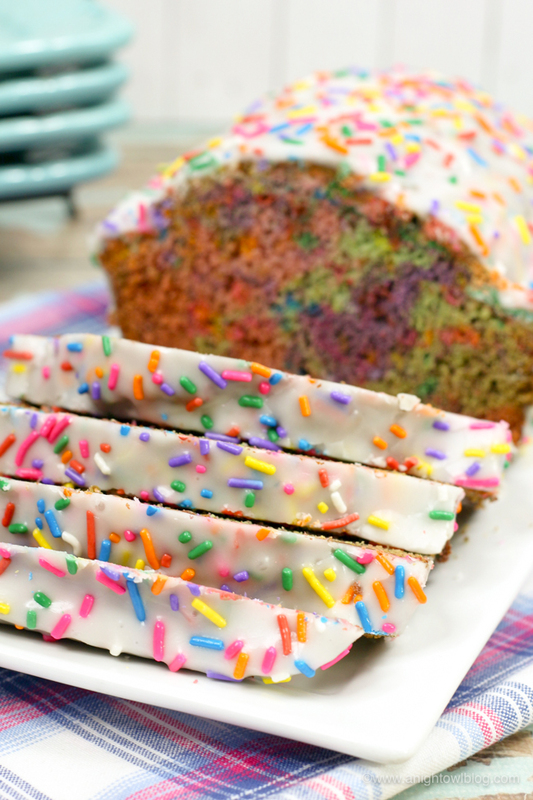 Sprinkle some unicorn sprinkles on top and allow icing to harden before slicing. 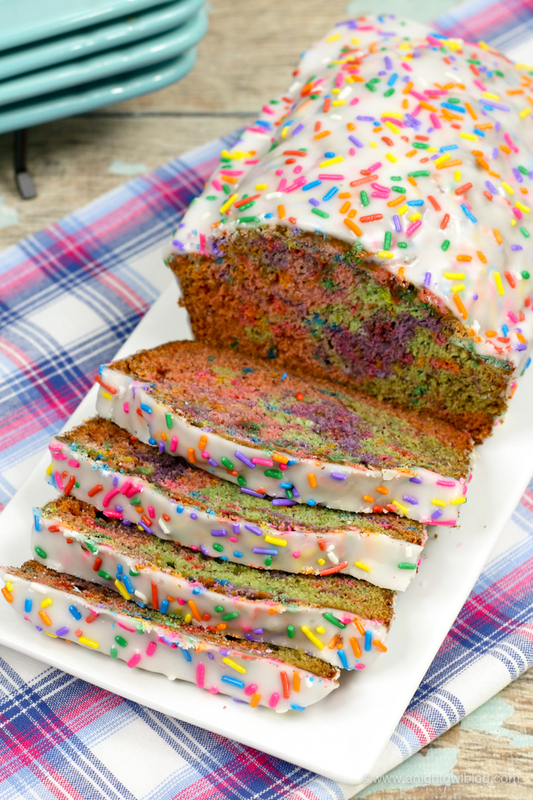 Unicorn Sprinkles: These fun unicorn sprinkle will make this fun bread look even more adorable with actual unicorn sprinkles! 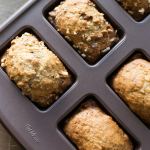 Silicone Loaf Pan: I love how easy it is to pop things out of silicone pan. This is a nice option for this bread. Wire Racks: This dish fits perfectly in the Instant Pot! 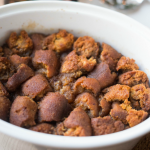 It’s a great piece to have in your kitchen for all the Instant Pot casseroles!